At AXS Studio, we’re big proponents of “learning by doing”. It’s a principle we strive to bring into the design of all our medical interactive media. So when it comes to our own professional development why would we do anything different? Last year, we created the AXS Challenge Day – an opportunity for our production team to learn new skills and have creative control over a project. The challenge is less about creating polished finished products and more about having a safe space to step outside your comfort zone and take risks. Our most recent challenge paired up our animators and developers to build Summer-inspired interactive experiences, with the end goal of developing skills and tools for navigating the often quirky Maya-Unity production pipeline and workflow. When striving for visually stunning interactive experiences, it’s often hard to draw a line where the role of the programmer ends and the role of the artist begins. I would argue our best technical art arises from blurring this line or removing it entirely. It takes collaboration and conversation; bringing together people with diverse skill sets and experiences. And with the recent release of art and design oriented Unity features such as Shader Graph, Timeline, and Cinemachine, it’s a great time to build on those skills. 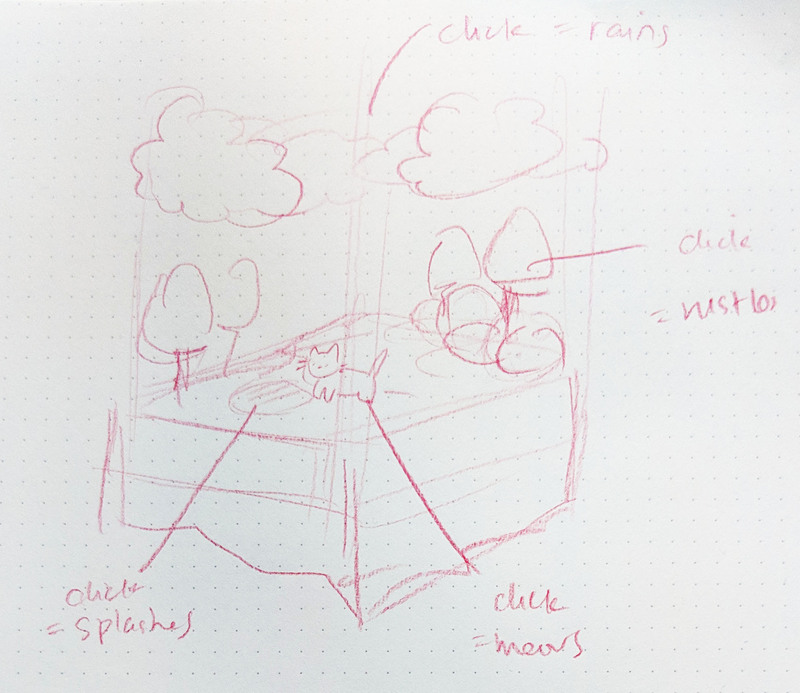 AXS Summer Challenge developers Raheel and Matt and animators Ruth and Man-San © 2018 AXS Studio Inc.
Wireframe sketch of simple Unity interactive. Sunny environment for cat © 2018 AXS Studio Inc. The teams had one day to make their own Summer experience and we were blown away by the end results. Unity development clip of snake navigating with user clicks © 2018 AXS Studio Inc.
Ruth Chang and Raheel Zubair made a game about a colour-changing worm on the hunt for fresh fruits. The hilarious expressions of the worm are a combination of rigged animations and blendshapes created in Maya while the burrowing displacement effect is driven by shaders in Unity. Everything from the motion of the character to the small texture details in the scene came together nicely to create a fun experience. Development clip of blendshape clouds being animated with pokeball in Unity © 2018 AXS Studio Inc. The studio is a little obsessed with Pokemon Go as is evident from Sam Holmes and Matt Ostil’s look inside a beachside Pokeball. Here, almost every part of the environment has a subtle combination of Maya and Unity-made animations to make this busy, confined space really come alive. Clip of sunflower blooming and blinking using blendshapes in Maya © 2018 AXS Studio Inc.
Stuart Jantzen, Man-San Ma, and David Tran built this wonderful sunflower simulation. The team came up with a creative solution for seamlessly transitioning between animations with different rigs and blends. Within Unity, each flower’s animation is then procedurally altered as they reach out for sunshine. Finally, the teams met to reflect on their work, share tips and tricks, and discuss any roadblocks they hit along their journey. The challenge is over but our learning doesn’t end. Our goal was not to train our team on a technical pipeline because one perfect pipeline doesn’t exist. The diverse nature of our work requires creative problem solving, teamwork, and the ability to fail and iterate quickly. I think we’re all eager for another challenge. What should we do? Any ideas for themes or skills to tackle?